I love foods from Arabic countries. The freshness and rustic tastes. I was recently watching a Travel Food Show taking place in Lebanon and had the strongest craving for those flavours. 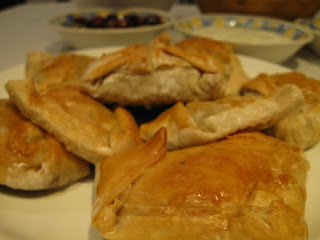 So I put together a Meze, the focus dish being Lebanese lamb pies. I'd never worked with phyllo pastry and it became obvious to me why many people are afraid to...it really does take practice. The pastry didn't end up being super flaky and fluffy once cooked because I missed a step and tried to fold them differently (whoops!) but the pies still tasted delicious! I will try the phyllo pastry again sometime because I do like the challenge of trying to get it right but next time I will try using the simpler puff pastry to compare. - Mix the butter and oil and keep to one side. - Lay out a sheet of filo pastry on a clean work surface and cut into three-inch strips lengthwise. 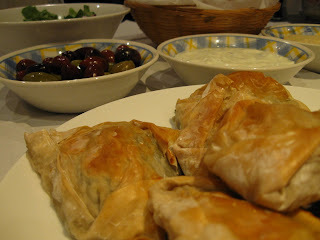 - Using a large soup spoon, place a dollop of the lamb mixture at the top right-hand corner of the filo strip. Take the top right-hand corner and fold over the pumpkin mixture to the left. The strip should now have the beginnings of a triangle, with the peak at the upper left-hand corner. Continue folding the strip in the shape of a triangle, brushing the filo pastry with butter+oil mixture before each fold. Once you've reached the end of the strip, place on the baking sheet and brush with beaten egg. - Continue until all the pumpkin mixture has been used, making about 15 triangles. - Bake for approximately 30 mins, or until the filo is crispy and a dark golden brown. I served this with some naan bread (I had some in the freezer so thought it would work as a replacement for flatbread), olives, humus, yoghurt and cucumber dip, and salad. Delish Meze! And thanks for following my entries!